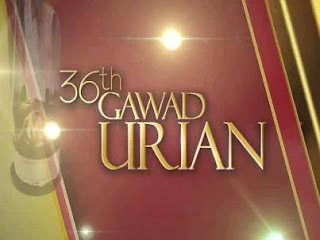 The 36th Gawad Urian Awards announced the list of winners yesterday, June 18, 2013, at NBC Tent in Bonifacio Global City. Ms. Nora Aunor and Jericho Rosales are the top winners of the said event. And the Best Film awards goes to, "Ang Paglalakbay ng mga Bituin sa Gabing Madilim" by Arnel Mardoquio. Best Actor: Jericho Rosales - "Alagwa"
Best Actress: Nora Aunor - "Thy Womb"
Best Sound: Willy Fernandez, Bong Sungcang, Ferdinand Marcos Sabarongis - "Florentina Hubaldo"
Best Music: Diwa de Leon - "Baybayin"
Best Editing: Aleks Castaneda - "Kalayaan"
Best Production Design: Brillante Mendoza - "Thy Womb"
Best Cinematography: Whammy Alcazaren - "Colossal"
Best Screenplay: Mes de Guzman - "Diablo"
Best Director: Adolfo Alix, Jr. - "Mater Dolorosa"
Best Supporting Actress: Alessandra de Rossi - "Sta Nina"
Best Supporting Actor: Art Acuña - "Posas"
You can watch the Awards night of the 36th Gawad Urian on Cinema One on June 22 at 3 p.m. and 11 p.m., June 23 at 10 p.m., and June 26 at 7 p.m.
For the meantime, If you feel that this details are informative, please bookmark it now or visit this site more often for you to be updated. You may also share this post to your friends so they may know about 2013 Gawad Urian Awards Winners. Comments or suggestions about "Gawad Urian Awards 2013 Winners" is important to us, you may share it by using the comment box below.